Updos for long hair are not just for women. 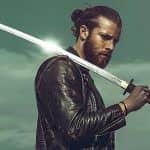 From dreadlocks to ponytails, from men buns to top knots – there are dozens of great updo hairstyles for men. 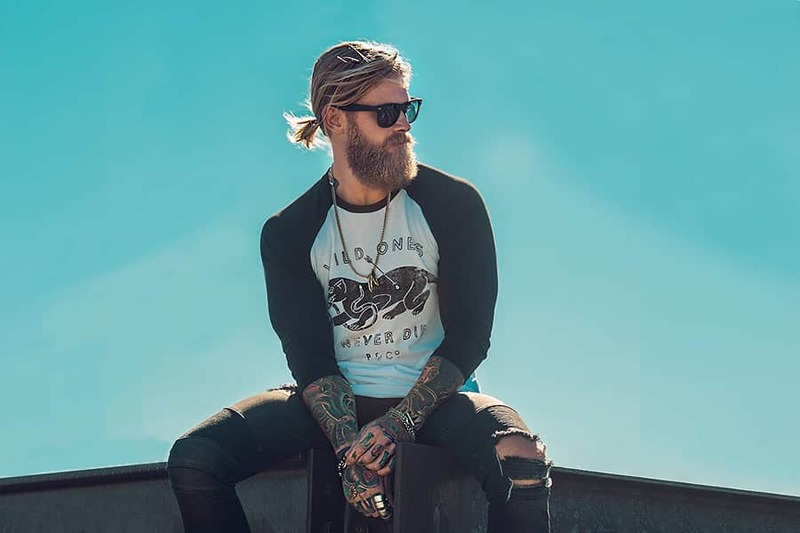 We have put together a handy guide containing some of the hottest looks for men to help you find the one that fits your lifestyle best. Men used to get a bad rap for having long hair. However, now men’s long hair is very popular, as are the updos for long hair for men. So, what are the updos for men? 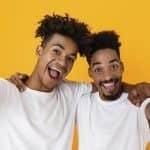 Men can pretty much rock the same updo styles as women, but the most popular updos for men include man braids, dreadlocks, top knots, man buns, and ponytails. The best part is that you can pretty much wear these with any haircut from fades to undercuts and really long hairstyles. Updos are the perfect everyday style for men as they are a great way to keep your hair out of your face and off your back and neck. They are perfect for hot summer days and windy or rainy weather. 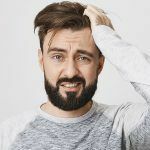 If you are still unsure if an updo for long hair is right for you, check out our helpful guide for men with long hair. The men ponytail rose to popularity in the 1980s, as more and more men began to grow out their hair. Hair bands and punk rockers alike were sporting longer hairstyles, and these gave birth to ponytail hairstyles for men. If you are looking for simple updos for long hair, you can not go wrong with the ponytail! Obviously, one of the hottest looks of men’s updos for long hair is the long ponytail. It was popular back in the 80s with both rock and roll stars and those who practiced martial arts. Long ponytail styles are tightly secured on the back of the neck or higher with a few loose pieces on the sides or behind the ears. As mens undercut hairstyles are becoming more and more mainstream, ponytails with undercut hair are also now very much in demand. This ponytail with a side undercut is a great option for those who want to portray an edgier vibe. Ask for an undercut and then comb the top of your hair into a neat ponytail on one side. 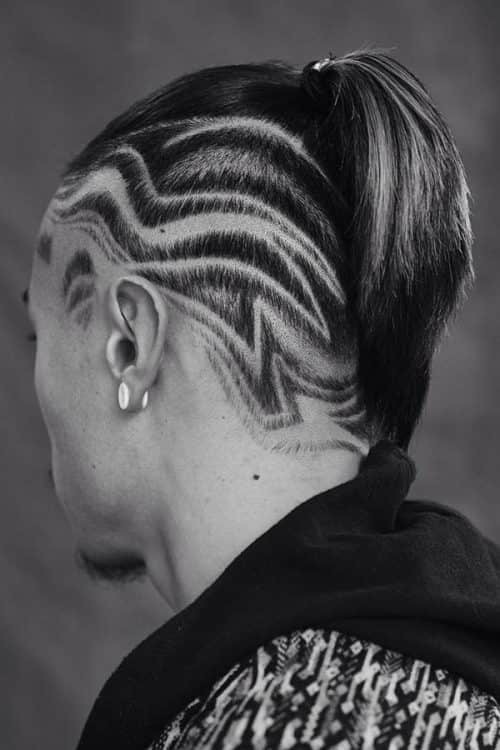 If you want to look even bolder, get a cool head tattoo along with your edgy undercut. A top knot differs from a man bun in a way that it is a smaller version that forms a tight knot, in most cases. As well, it is located on the top of the head as opposed to the back like a man bun. Top knot hair is very popular among men’s long hairstyles. To style top knot men, gather your hair and tie it as though you are making a man bun, but keep it on the top of your head and make it a tight knot as opposed to the fuller man bun. Top knots are a great choice for half updos for long hair. If you are looking for cool half updos for long hair, try a Samurai top knot. This is a take on the traditional Japanese Samurai hair with half of the hair drawn from the front of the head into a top knot. It looks great with stubble or a fully-grown beard and is one of the hippest updo hairstyles for long hair for men today. Fade haircuts are making a huge splash with men of all ages. They are a great way to show off a top knot as well. Ask for a faded undercut and style the length of your hair into a top knot. This style looks great with various hair designs and even plaits which grant it more cultured and stylish look. Every man wants his hair to make him look masculine and stylish. Now, we are modern enough to acclaim that a bun is totally universal. If you see a man with long hair bundled together on top of his head, yes, it’s the man bun style. These guys who don’t like to wake up early in the morning to get their hair done, congratulations: this is officially the easiest hairstyle ever. Everything you need is a proper hair length. For those men who have long flowing hair, you can totally rock a half up man bun hairstyle! A man bun is a more relaxed version of the top knot and looks especially good on men with long, wavy or curly manes. Style your hair in a looser top knot, or man bun, and then spray the rest of it with sea salt spray to add it volume and texture. 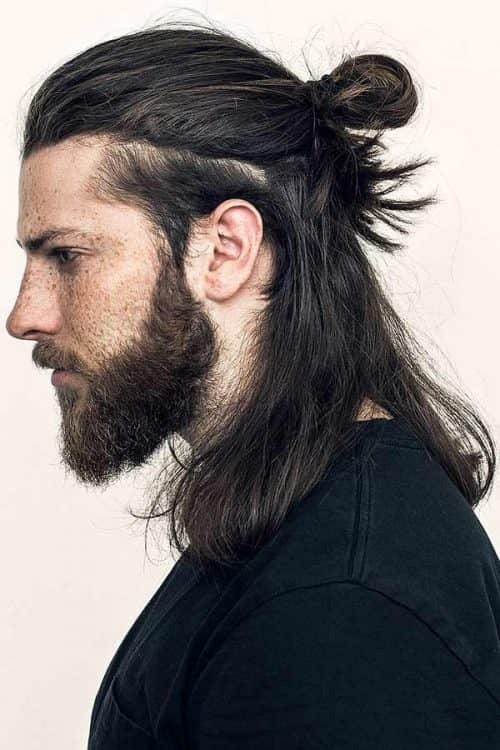 Half updos for long hair are very popular for men with long hair. Man bun hair looks especially stylish on men with wavy or curly hair. Man bun styles are easy to style and maintain as you can wear them for several days at a time. If you have curly hair, you can pull it into a messy man bun on the top of your head. This look is perfect for those hot summer days. Mens straight hairstyles do not have to be boring. A sleek, tight man bun with a twist is a simple but stylish mens hairstyles for straight hair. Put some gel in your hair and style it straight and sleek, pulling it back into a tight chignon man bun. Man braid hairstyles are a very stylish option for men who have a lot of hair. A typical man braid will require at least three to five inches of thick hair. However, if you want to sport a man braid with short hair, you can braid the top of your hair to rock a fade or undercut style. There are many styles of braids from Dutch braids to French braid or Box braids and even dreadlocks. If you are unsure of how to duplicate any of these styles, you can find some tutorial videos on Pinterest, Youtube or Instagram to show you how to rock a man braid with a wide variety of men’s hairstyles. Men bun with braids hairstyles are showing up everywhere these days. Moreover, what is better than one braid? Multiple braids, of course! Make several tight braids and tie them into a man bun braids at the bottom for a unique look! Other popular man bun braid styles include this stylish nape braid on a faded undercut. This works great with a V cut undercut fade. Then make an inverted French braid to resemble a Mohawk for a look that is totally avant-garde. If you have long hair, man braids are a great way to securely tie back your hair. This Dutch braid is not only serving a purpose, but it’s also very stylish and hip. Natural hair styles are a great way to show off man braids. Braided hairstyles for natural hair do not require a lot of maintenance. These natural hair braids are styled with the snazzy undercut fade and a cool hair design. Dreadlocks hairstyles for men have been around for hundreds of years and are not going away any time soon. They are ideal for men who want to live a Bohemian lifestyle and show off their free and independent nature. Locks or dreads as they are also called, are extremely versatile and are becoming popular with men all over the globe. If you are looking for dreadlocks styles for men, look no further. This updo with dreads is one of the coolest dreadlocks styles right now. Dreads and updos are a great combination for anyone who wants to rock the dreadlocks hairstyle. Another great dreadlocks men hairstyle is the half up/half down ponytail. This look is very casual and is a great way to rock your dreadlocks. Dreads are perfect for half updos for long hair. If you have a special event to attend and you are worried about finding a stylish updo for long hair, do not fret, there are many styles right under your nose, literally! We have some great easy updos for long hair for formal affairs. Weddings are one of those occasions where you do need to make a special effort to style your hair. Wedding hairstyles require a very sleek and sophisticated look that needs to be polished and flawless at all times. However, prom hairstyles, while still required to be somewhat neat and tidy, have a bit more room for individuality and more relaxed styles. If you are looking for easy wedding hairstyles, you can not go wrong with a sleek and polished updo. This wedding hairstyles updo is a simple but elegant man bun combined with a neatly trimmed beard that gives off an air of sophistication that will fit in with any style of wedding crowd. Prom hairstyles for long hair do not have to be quite as formal as a wedding hairstyle. This prom hairstyles updo is merely a tight top knot that is classy and neat yet still trendy and hip. If you are going to a party and want to sport a totally rocking hairstyle, this braided Mens faux hawk is the answer to your hair woes. Style your long hair into a faux hawk braid to add volume and texture to your hair. Going to a music or art festival? How about this cool Viking hair? Viking hairstyles are all the rage at festivals these days so why not rock this awesome Viking hairstyle and show off your unique flair! Therefore, as you can see, updos for long hair for men are incredibly versatile. You can choose anything from a top knot to a man bun or a ponytail. You can totally rock those dreads or man braids. Have fun playing around with different updos for men’s hair until you find the ones that work best for you.